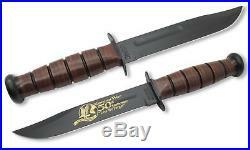 This original KA-BAR knife was made to commemorate the 50th anniversary of the war between North and South Korea, 1950 - 1953. 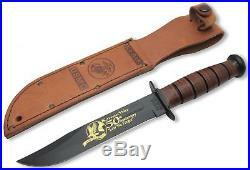 The tang of the decorated blade is stamped USMC. Blade Length: 7" Overall Length: 11.7/8" Steel: 1095 Carbon Steel Handle: Leather Sheath: Leather, made in Mexico Weight: 11 ounces (knife only). Listing and template services provided by inkFrog. 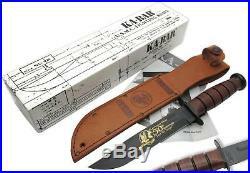 The item "KA-BAR 02-9106 USMC Korean War 50th Anniversary 1950-1953" is in sale since Monday, February 9, 2015. This item is in the category "Collectibles\Knives, Swords & Blades\Collectible Fixed Blade Knives\Modern Fixed Blade\Factory Manufactured". la" and is located in Los Angeles, California. This item can be shipped to United States, Canada, United Kingdom, Denmark, Romania, Slovakia, Bulgaria, Czech republic, Finland, Hungary, Latvia, Lithuania, Malta, Estonia, Greece, Portugal, Cyprus, Slovenia, Sweden, Taiwan, Thailand, Belgium, France, Hong Kong, Ireland, Netherlands, Poland, Spain, Italy, Germany, Austria, Israel, Mexico, New Zealand, Philippines, Norway, Qatar, Kuwait, Bahrain, Croatia, Malaysia, Brazil, Colombia, Costa rica, Dominican republic, Panama, Trinidad and tobago, Guatemala, Honduras.